Why does email disappear from my phone? - Ask Leo! When adding another device to access your email, it's easy to run into a situation where email seems to disappear. I'll look at the most common reason and what to do about it. I keep running into a situation where I see an email on my mobile phone, and then a little while later it’s gone. Yet when I get home, it’s there in my email program (Outlook). Having email disappear does me no good when I’m out and about. How do I get those emails to ‘stick’ on my phone? With more and more people reading email on their smartphones, this is actually a pretty common situation, as it’s very easy to misconfigure things when adding a phone to your setup and have email seemingly disappear. I’ll review what I think is happening, and then explore the alternatives to fix it. 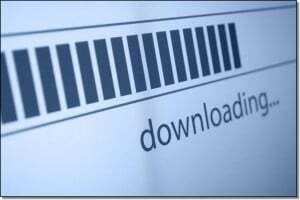 For years, most desktop email programs were configured to download email from the email service to the computer on which they were running. What that really means is that the programs are configured to use the POP3 email fetching protocol. POP3, by default, moves the email from the email server to your PC. The result is that after the email is copied to your PC, it’s removed from the mail service’s server. Your PC was where you dealt with your mail, so there was no point in having anything on the server after it was downloaded. Mail service providers often limited the amount of space you could use anyway, often to a small enough amount that even the mail that accumulated over a multi-week vacation could exceed what’s called the “quota”, or the amount of space you’d been allocated. In recent years, however, both of those reasons have pretty much been dispensed with. When a mobile phone accesses email, it does so from your email service provider, of course, but it does so in a different way. Most email programs that run on mobile devices use a different protocol, called IMAP, to access email. IMAP differs in that instead of moving mail to the device you’re using, it simply makes a copy without removing anything from the server unless you tell it to. It synchronizes in such a way that when you delete on your device, it’s deleted on the server; when you read on your device, it’s marked as read on the server; when you move things around in folders on your device, things are moved around in folders on the server. The mail server is the official place that email is kept, not your device. Your device is simply a “window” into that master copy. Multiple devices could all be accessing that mail server at the same time. IMAP keeps them all in sync. IMAP is perfect for today’s world where we can assume connectivity most of the time, and it’s not at all uncommon to want to access email from different devices and in different ways at different times. Here’s what I think is happening to you. You have your desktop email program configured to download your email to your PC using POP3. Thus when it checks for email it moves that email to your PC, removing it from the mail server. You probably also have that desktop email program configured to automatically check for email every so often – perhaps 5 minutes, perhaps 30 or more, but the key is that you don’t have to be around. As long as the mail program is running, it happily downloads your email on a regular schedule. Your mobile device is accessing your email using IMAP, which means that it’s simply providing you a picture of what’s on the mail server. The net result? That “picture of the mail server” changes every time your desktop email program downloads email. Mail that arrived on the server since the last time it was checked is downloaded to your PC and removed from the server. From the phone, the email looks like it disappeared. There are two basic approaches to solving the conflict: the right one, which takes more work, and the practical one, which amounts to a hidden setting. The right solution is to configure your desktop email program – you mentioned it was Outlook – to use IMAP. That way it becomes “just another device” with a window on to the master collection of email stored on your email server. The issue here is that you can’t convert an account in most email programs from POP3 to IMAP. Instead you have to set up a new account within the mail program, using the same credentials but this time specifying that IMAP will be the protocol not POP3. In Outlook that’ll create a separate and new set of folders for the IMAP version of the account. You can then delete the POP3 configuration. I call that the right approach because then everyone is in agreement: the mail server contains the master copy of your email, and everyone else – your phone, your desktop PC, your webmail, and whatever other devices you add in the future – all simply provide a local copy or view of that master copy. Your email provider still has draconian limits on how much email they’ll store for you. The process of converting from POP3 to IMAP that I just outlined is too daunting for you. In this case we’ll leave the desktop PC configured to use POP3, but make a change to an obscure setting. By selecting this option, Outlook will simply skip the step where it deletes the messages after it downloads them. You can also have it automatically delete messages on the server after a certain number of days, or when you actually delete them in your mail program. What this will not do is synchronize anything else. If you read an email on your PC, for example, it’ll still show as unread on your phone, and folders are not supported – POP3 is only about downloading into your inbox. But it could be a reasonable solution to your current issue. And of course next time, with a new account, perhaps you’ll be able to set up IMAP from the start. 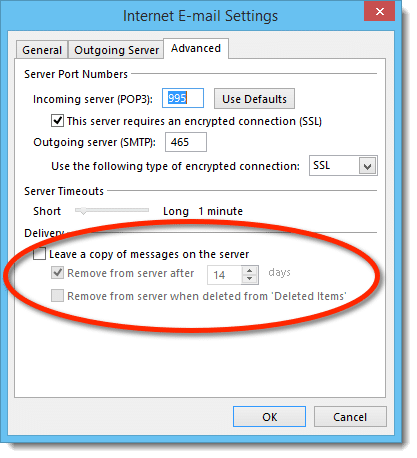 What Are Outlook.com’s IMAP, POP3, and SMTP Settings? - Microsoft has enabled POP3, IMAP, and SMTP access to Outlook.com, and thus to Hotmail accounts. I'll walk you through the settings. Another possibility is that, though both Outlook and the mobile phone are actually in sync, the mobile phone is set to only display by default a certain number of messages or perhaps messages within a certain time frame. At least that’s why that would happen on my phone. “POP3, by default, moves the email from the email server to your PC. ” That’s true with many if not most email programs. But the good news is that by default, Thunderbird now leaves the mail on the server when downloading. I imagine it has something to do with the fact that they realized that most people access their email on multiple devices. I use Gmail. I have Windows 7 Premium and use a Samsung SIII phone. Sometimes when I respond to an email with my phone, it disappears. No one gets it, it doesn’t appear in the Sent folder, or the Outbox, or the All Mail folders. Have you ever heard of an issue like this? Many Thanks! I recently got an Android tablet (a 7 inch Asus MEmO Pad) as an experiment and this phenomenon of disappearing emails drove me crazy for awhile. We have an ISP (Earthlink) that still limits email fairly tightly, and use both Windows 7 (Thunderbird) and Mac OS 10.9 (Apple Mail) to access the server via POP. On both platforms I have them set to leave things on the server for two days. My main mobile access is my iPhone, which knows the Earthlink account is POP and downloads a copy of each message. These accumulate on my phone. When I got the tablet at first it just seemed nuts that things would just disappear and finally I figured out that the tablet was trying to synch with Earthlink’s server. So I found the synch setting, and turned it off. It didn’t help! After awhile I finally just killed my account on the default email program that came on the thing and dowloaded a different mail app (K-9 Mail) and told IT not to synch. Finally…. I’m getting what I expected. But I do agree that having copies of messages on all these devices (currently a total of a desktop, two laptops and two mobile devices), all of which have an independent view of the world, gets to be rather tedious after awhile because I have to deal with the mail on each one separately. Someday we’re going to buy our own domain name from Simple Online Solutions and set up email there as you have suggested in the past….and going the IMAP route at that time will make lots of sense. My Outlook.pst is my email repository for a POP3-accessed gmail account–I can’t bring myself to rely on gmail to the extent of giving up Outlook. But, I always switch it off in one way or another when I’m away from my computer. I then find my iPhone gets all new email and keeps it there. If by some chance I have forgotten to switch off Outlook I find that, on my iPhone, the “All Mail” Mailbox folder will always display recent emails. Thanks Leo. This was very helpful. I never understood the distinctions between Pop3 and Imap before. I appreciate your contribution to making my sojourn on Rock #3 a bit more enjoyable. I am not sure of all email providers but with the one we use, ATT Yahoo, when it downloads to the pc it deletes it on the server which actually adds it to the Trash folder on the server and I have on occasion looked at an email from that location because I left Outlook open or my wife is at home while I am not. I have tried clicking the “Leave a copy of messages on the server” only to have it download the same messages the next time Outlook would check and end up with several copies of the same message in my Outlook inbox. Phones don’t simply download emails, they synchronize the accounts between your devices using a protocol called IMAP. Anything deleted on one device or computer deletes it from the server and this synchronizes wit all of your devices. The only way to prevent it from being deleted from your phone is to not delete it on your tablet. Thanks that worked.. It was frustrating when I was away from my desktop and couldn’t reference a customers email. Hi Leo! I have a similar problem; not between a computer and a i-phone; but between 2 computers. The emails go to both computers. When I go to delete an email on 1 computer, it also deletes it off of the other one where it hasn’t been read yet. I have read your comments in the articles above. I will look and compare and examine if there is anything similar between POP3 and Imap settings. Appreciate any comment you have! Dan. Sounds to me like both are connected via IMAP where this is exactly the expected behavior. Hi there. If I had any hair, I would be pulling it out. My main email address is an IMAP account which up until last week worked flawlessly, email being received on PC and iPhone without a hitch. Since then, emails occasionally show up on my phone then vanish in front of my eyes. And nothing is being received on my PC at all. I haven’t changed any settings on Outlook 365 or the phone whatsoever. The only change I can recall is the IOS update last week. Can anyone offer a solution, please? This is a complete nightmare! IMAP emails disappear off of phones as well and I think the reason is that the computer supports folders and my phone does not. I use lots of rules on incoming mail in Outlook. I see all new mail on my Blackberry – those in the inbox as well as those automatically placed in folders by desktop rules. BUT the messages in desktop folders disappear from the phone after some time (not sure how long) even though they’re unread. The “inbox” ones remain. Meanwhile, if I read a message on the phone and close it, I can’t retrieve it again on the phone if it was a “folder” item, only if it is in the regular inbox on the computer. I’m thinking of deleting all my rules and only moving messages to folders manually when I’m certain i don’t need to see them on the phone anymore. Is there a better way?? Message lying in delete folder when tried to move to Inbox on wrong deletion .The action took place in restoring the mail from delete folder but mail moved out of delete folder did not appear in inbox folder . Request to let me know where to search for the restored mail since it is very important .lost before backing up. I have tried to set up a new IMAP account in Outlook as you suggest, whilst there is a similar POP one with the same address, and I am prevented from doing this. Any reason why? You can’t set up a new IMAP account once you have an account with that address already, but the good news is you can access your existing account using IMAP. In GMail you have to go into the settings to enable IMAP, but in Hotmail/Outlook.com, you simply have to set up your email account to access it via IMAP. In fact, you should be able to access the account on one device via IMAP and another device using POP3, although using POP3 might delete all of your emails from the server after downloading if it’s not properly set up. You might have to delete the account from your email program before adding the account again for IMAP access. I don’t believe you can have two accounts that actually attempt to access the same email account in Outlook. We run Vista on our office desktop and, because we have it listed on stacks of stationary, we still use our old AOL email addresses. We use Thunderbird so that I can keep both email accounts in front of me all day, without having to log out and log back in to view each account in AOL. What happened to my missing emails? How can I find them (they have not been deleted on the smart phone or the desktop)? When I asked someone else about this, they said it was not an email/Thunderbird/AOL issue but, rather, something to do with the cell phone service provider/software. Does anyone have any idea how to help me find my emails? I would be very appreciative. Thank you. i use a POP3 account setting on my desktop. If i switch that to an IMAP account setting, will i lose all my old emails, contacts, etc? If you set up a second account on your email program to access your emails via IMAP, you shouldn’t lose your downloaded POP3 emails. In fact, you can copy all of your POP3 emails to their corresponding IMAP folders and they should upload to the email service provider’s server. You should not. Backup first anyway. Hi. I use a pop3 account and when I get emails on my old Blackberry , via pushmail,they remain on the phone even after I’ve deleted them from the server ( due to limited space). On my Galaxy Tab 4 android tablet, the emails are deleted as soon as I delete them from the server. Is there a way by which they are not deleted on the android tablet after z I delete them from the server ? Will a Windows smartphone enable me to do this ? Also, will the newer generation BlackBerry phones be able to do this ? I want to retain the emails on my phone and would be very grateful for any guidance. You need to run a POP3 mail client on your phone. Most will default to IMAP, which is nothing more than a “mirror” of what’s on the server. I have opposite problem, gmails saved on computer initially under different labels are disappearing. But I cna find them on my android phone. I’d hate to have to email them all over…Ideas? Leo, thanks for the tips. I made such adjustments to keep my emails for 14 days on the server so I can still see them on my iPhone 6 later. BUT, here is the BIG problem. If my iPhone 6 has no data service. Like when you are traveling in an airplane, then I can see nothing. It needs to be online either wifi or data. Do you know how I can keep my emails on my iPhone 6 memory. Thanks. Yes, it’s the Outlook settings causing the disappearing email. This was the solution, well done. It’s likely you have a setting in Outlook that tells it to delete the email from the ISP’s server when Outlook downloads the mail. Once that happens, the iPad can’t see it anymore. By telling it to not delete for about 3 days, it should remain visible for 3 days. A more useful solution is to switch all devices to use IMAP. IMAP is designed to sync with multiple devices by keeping the main copy of email on the server. That should solve the issue. Simple fix to an annoying problem – worked first time. Thanks! Thank you! I’ve never understood the difference between IMAP and POP3 but your explanation was clear enough for me to grasp the basics at last! I’m off to reset my outlook now! A very grateful ‘silver surfer’. Thank god for you! I have been entirely unable to set up an IMAP mail account so the cheats way has saved my sanity! Email disappeared from my iPhone 5 the other day – but only from the Drafts folder. Email is set up using POP3. Are these drafts stored on the iPhone and is there any way to get them back? Thank you. Thanks, this was a big help. I had Outlook configured on my phone to sync in one day, so the mailbox was wiped that frequently! Changed to one month, problem solved. Also, it is possible to use search on mobile to find server stored email, but it’s more time consuming. I have my Iphone 6 and before the outlook change when i used to recive a email on my phone it let it read in my outlook so when i connected to my outlook account on a computer i saw it unread…. now every time my phone vibrates; even if i havent open the mail app on my phone, marks the email in my outlook as unread and i dont want that. It makes me feel like i have been hacked… I have been looking for people with this same problem but cant find… because i have seen it happen right now i have come to the explination that is the outlook change but that doesnt explain why it skips emails and let them in unread and later on goes again and e few emails up marks them read… i dont know what to do this thing is making me crazy and i want to stop using outlook can you help me? That doesn’t sound like a hack, or anything to do with outlook.com. It sounds like your email app is broken. I’d try uninstalling and reinstalling the mail app (I don’t know if that’s possible in an iPhone). Or install a different mail app and start using that as your default mail app. hi, I sent an email yesterday and copied 2 others on it. I received a failure notice that one of the email address was invalid. I went to resend the email and its no where to be found. I have checked all folders, and searched by email title, nothing comes up. The email was sent from my cell phone. I checked on my desktop, still nothing. Is there something on the failure notice that I can type in and it would pull the original email? Or is there away that I can search the server from my cell phone to see if its there? I know that it is stored somewhere because I got the failure? Thanks in advance for all your input. Thank you so much. Just by checking the leave a copy on the server box it now doesn’t delete my messages on my iPhone. Great help I can’t thank you enough. Generally, iPhones and other mobile phones default to using IMAP which doesn’t remove the email from the server unless you delete it on one of your devices. I have the opposite problem. My outlook account is set up with IMAP and when I look at my ISP I see the same list of emails as are showing up in Outlook. However my cell phone (Samsung S5) is showing emails in my inbox that I have deleted AND even some emails that I don’t show as being received anywhere. In other words it appears that my cell phone has a more complete if not fully up-to-date list of received emails. How is this possible?